Auction Content is Being Updated Daily - Keep checking back for latest details. | ONLINE BIDDING FOR THIS AUCTION WILL BE AVAILABLE DURING THE LIVE AUCTION EVENT. 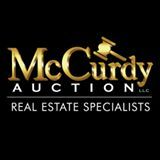 McCurdy will be offering live streaming during this auction where you will be able to watch, listen, and bid live online during the auction event. Download the app on your phone now, search for "Bid McCurdy" in the app store. ALL PROPERTIES ARE OPEN July 29th FROM 1-5 PM. These properties belong to everyday home sellers, estates, landlords, banks - motivated to sell! All properties selling with clear title at closing and no back taxes.